For the lead voice in counterpoint, see Hauptstimme. The lead vocalist (or main vocalist, lead vocals, or lead singer) in popular music is typically the member of a group or band whose voice is the most prominent in a performance where multiple voices may be heard. The lead singer either leads the vocal ensemble, or sets against the ensemble as the dominant sound. In vocal group performances, notably in soul and gospel music, and early rock and roll, the lead singer takes the main vocal part, with a chorus provided by other band members as backing vocalists. Especially in rock music, the lead singer or solo singer is often the front man or front woman, who may also play one or more instruments and is often seen as the leader or spokesman of the band by the public. As an example in rock music, Freddie Mercury was the lead singer of Queen. Similarly in soul music, Smokey Robinson was the lead singer of The Miracles. 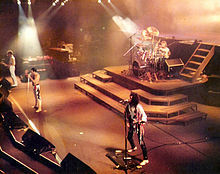 Queen performs in a typical rock band layout during a 1984 concert. Lead singer (front man) Freddie Mercury stands centre-stage in front of drummer Roger Taylor and positioned between bass guitarist John Deacon and lead guitarist Brian May. It is uncertain when the term "lead vocals" was first used, but it may have emerged in the late 1930s, when rich vocal interplay with multiple voices where one or more voices may dominate began to impact on North American popular music, which was previously dominated by solo vocals. The practice of using a lead singer in vocal groups, however, has a longer history: an early form is the "call and response" found in work songs and spirituals sung by African-American slaves. Songs of the late nineteenth century frequently used a leading solo voice (or "call"), followed by a choral response by other singers. As the style developed through early commercial recordings and performances in the early 20th century, the role of the lead vocalist became more established, although popular groups of the 1930s and 1940s such as the Ink Spots and the Mills Brothers generally used different lead singers on different songs rather than keeping the same lead singer throughout. By the 1950s, singers such as Sam Cooke (with the Soul Stirrers) and Clyde McPhatter (with the Drifters) took on more clearly defined roles as lead singers, and by the end of the decade credited group names often changed to reflect the leading roles of the main vocalists, with examples such as Frankie Lymon & the Teenagers and Dion & the Belmonts. The influence of US rhythm and blues recordings may well be a crucial one in the assimilation of the format of lead singer plus backing group into the guitar-based British 'beat' groups of the 1960s, and in US groups such as The Beach Boys. From these various points - including Motown - it went on to become a standard device in much rock and pop music. In some bands - most famously, The Beatles - the role of lead singer alternated (in this case, principally between two performers), while in others - for example, Herman's Hermits - one lead singer dominated. There are as many types and styles of lead singer as there are styles and genres of music. However, the lead singer of a group or band is usually the main focus of audiences' attention. The lead vocalist of band is sometimes called the "front man" or "front woman," as the most visible performer in a group. While most bands have a singular lead singer, many others have dual lead singers, or other member of the band that occasionally sing lead on particular songs. While the lead singer often defines the group's image and personality to the general public, this is not always the case. In modern rock music, the lead singer is often, but not always, also the band's leader and spokesperson. While lead singers or spokespersons for any musical ensembles can be called a front man, the term is used very widely in rock music. Since the position commonly has an expanded role from simple lead vocalists, there have been cases in which the front man for a band is someone other than the lead vocalist. For example, while the lead vocalist for the band Fall Out Boy is guitarist Patrick Stump, the bassist and lyricist, Pete Wentz, is generally called the front man, both in the media and by the band members themselves, since he represents the band in most interviews and contributes most to the band's image in the popular media. Another example is Angus Young of AC/DC, who is the band's lead guitarist, and co-leader with his brother Malcolm Young (until the latter's death in 2017); while lead singer Brian Johnson (and before him Bon Scott) is the band's front man, Angus Young can be thought to share the front man position with Johnson, due to his on-stage antics and his role as the band's mascot, frequently featuring on album covers and promotional materials. In many bands, such as The Who, Led Zeppelin, Living Colour, Queen, The Stone Roses and Oasis, the lead guitarist may share spokesman responsibilities with the lead singer. Usually, this is derived from that guitarist's specific role as a co-songwriter, co-founder and/or co-vocalist. Also in some cases, there are two frontmen, such as Alice in Chains, with singer Layne Staley (and later William DuVall) sharing vocal duties with guitarist Jerry Cantrell, or Underoath, with singers Spencer Chamberlain and Aaron Gillespie (drummer) sharing vocal duties. Another example is Blink-182, in which vocal duties are split between bassist Mark Hoppus and guitarist Tom DeLonge. Hoppus usually carries out most media either by himself or together with DeLonge, while the band's other member, drummer Travis Barker, usually remains quiet. Linkin Park had two vocalists as well, Mike Shinoda and Chester Bennington, both considered as frontmen. Another example is the thrash metal band Metallica, in which James Hetfield (lead singer and rhythm guitarist) and Lars Ulrich (drummer) share the spokesperson duties for being both founders and the only members who have never left the band. ^ a b c John Shepherd, ed. (May 8, 2003). Continuum Encyclopedia of Popular Music of the World: Volume II: Performance and Production. Continuum. pp. 634–635. ISBN 978-0826463227. ^ "Definition of FRONT MAN". www.merriam-webster.com. Retrieved 2017-02-12. ^ "Jerry Cantrell Recalls How Alice in Chains Developed Their Twin-Vocal Sound". Diffuser.fm. April 25, 2017. Retrieved May 4, 2018.